These past years, flat-screen computer monitors have become the ergonomic standard for computer work in the workplace and the home office. Not only does a flat-screen monitor add style to a workstation and let you economize on workspace, it has the major option of being mounted on an adjustable ergonomic support arm or stand. When correctly used, a flat-screen monitor support arm or stand improves comfort levels quickly, resulting in considerable health benefits and increased productivity at work. Sales of this ergonomic accessory have jumped significantly on Ugoburo.ca, particularly items made by Humanscale and Workrite. Most office workers intuitively adapt their posture at work to the position of their computer monitor. However, monitors can be made very differently; for instance, Macs computer by Apple have unique physical characteristics that may not be suitable for everyone. It is therefore very important to position the monitor properly in order to avoid unnecessary discomfort or fatigue, which is why monitor support arms are becoming increasingly popular. When working at a computer screen, the head must be held high and straight, and the monitor positioned directly in front. After some time in front of a computer, users tend to relax their position somewhat by letting the head fall slightly forward. This change in posture, which tends to relax the neck, head, shoulder and back muscles, should occur only within the ergonomic comfort zone indicated by the orange section in the illustration below. If your posture takes you out of this zone, you’ll eventually feel tension and fatigue in the eyes and pain in the neck, shoulders and back. It goes without saying that using an ergonomic office chair is essential to enjoying optimal ergonomic function at work. Some accessories like a footrest or an ergonomic keyboard tray will help in achieving comfortable posture. Step 1 - Adjust distance : position the monitor at a distance of 18 inches (46 cm) or more from eyes, i.e. at about arm’s length. Step 2 - Adjust height : position the monitor so that the upper third section is at eye level. If you wear bifocals, as more and more workers do, it is recommended that the monitor be positioned lower than the orange section in the illustration. 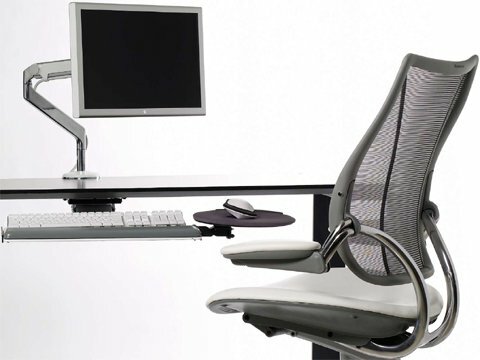 This can be achieved by using an ergonomic computer monitor support arm or stand. And that’s all there is to it! These simple adjustments will give you quick results with little effort. If you continue to experience pain or discomfort, speak to an ergonomist or a health professional. The above diagram may be reproduced only with written permission from Ugoburo.ca.